One of the most popular casino games in the world, Baccarat also happens to be one of the simplest to play and comes with some of the best odds in the casino. The game itself pits two hands against each other, the players get to bet on which hand they believe will win or if it will result in a tie. If you’re looking for more information on how the game is dealt and how to determine which hand wins take a read of our online baccarat rules. It’s never wrong to leave a table when you’re losing. Don’t get sucked into false logic or superstition. If you think you have those under control, here’s every tip you could need for beating online baccarat. There are only three possible bets in baccarat. You’re betting on the player hand to win, the banker hand to win or both hands to tie. Betting the player hand will pay you out at even money. Now the banker hand is slightly more likely to win, but you are charged a 5% commission from your winnings for betting on it. Betting on a tie will pay you out at 9-1, but as with any bet in a casino with long odds, it’s a suckers bet. You should never bet this under any circumstance. As for player versus banker, the math says you should play the banker every time you put down a bet. 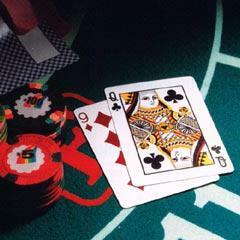 Baccarat is one of the few casino card games which has nearly no way to be exploited. While counting cards in blackjack can help a player win, even the greatest card counters will gain nearly no additional advantage when playing baccarat. You’ll see many players with pens and paper keeping track of the results, looking for trends or patterns. While this may be a good way to keep yourself occupied as you play, there is no possible way to gain an advantage by tracking previous hands. The odds of player vs. banker vs. tie are the same on this hand as they will be next hand. When you win a banker bet the casino does not take the commission from you at that time. Instead the commission is recorded and allowed to accumulate. You are required to pay the full amount of the commission at the time you leave the table. It’s good to keep track of how much commission you owe, if only to avoid embarrassing moments when trying to leave. That’s about it for Baccarat. To be honest it’s one of the easiest games to play, with some of the most even and fare odds in the casino. If you want to place some bets at the tables, baccarat is never an incorrect choice.